North Dakota may lie off the beaten track for National Park Service sites, but beauty and history can still be found at the five sites within the state. Let’s walk through what North Dakota has to offer. 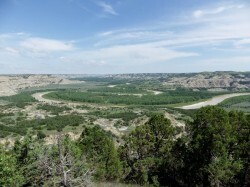 The most visited unit of Theodore Roosevelt National Park’s three units can peg its popularity on Interstate 94 travel and the city of Medora’s attractions. The gateway town offers its annual musical, golf, hundreds of hotel rooms and famous pitchfork fondue (among other getaways). The South Unit boats a 36-mile auto loop through the park, weaving through colorful bluffs, prairie dog towns, along the Little Missouri River and across Badlands vistas. The layered landscape is on full display with gold, red, black, brown and other colors striated over each other. 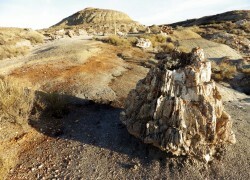 A walk in the park’s petrified forest is a must. The 55 million-year-old cypress stumps can measure up to 14 feet around and are heavily concentrated along a north stretch of the hiking trail’s loop. Be on the lookout for bison, feral horses, prairie dogs, pronghorn and elk. The horses are only found in the South Unit while the North Unit and Elkhorn Ranch feature their own specialties too. Visitors to the North Unit are 20 percent that of the South Unit, but visitation is up over 35 percent this year all around. 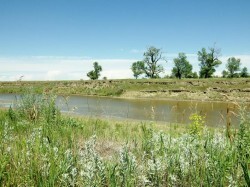 The North Unit lies 15 miles south of Watford City, and has been labeled the most beautiful of the three units. High, rugged, colorful hills tell the tale of erosion on the land while a turn-around auto tour takes visitors to overlooks, cedar canyons and river vistas. While the South Unit has its horses, the North Unit keeps a herd of bighorn sheep and an exhibition herd of longhorn cattle as tribute to the ranching industry of the 1880s in the Little Missouri Valley. River Bend Overlook, a high vista overlooking the Little Missouri River, is allegedly the second most photographed place in North Dakota. 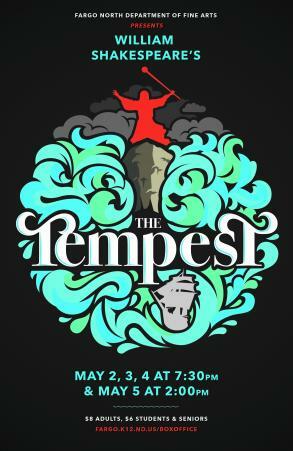 The Fargo Theatre may rank first. Beauty takes a backseat to history at the Elkhorn Ranch, a tiny NPS acreage preserving the ranch land of Theodore Roosevelt, who ranched and held such operations in the Little Missouri Badlands from 1884 to 1898. The Elkhorn Ranch is well off the beaten path and lies at the end of several twisting gravel roads. Visitors will be rewarded with sights and sounds as the young future president experienced them: wind rustling the tall cottonwoods’ leaves, the Little Missouri River flowing nearby on its generally northern course and what little remains of the Elkhorn Ranch—11 foundation stones laid by Roosevelt’s Maine hunting guides during its 1884-85 construction. Several camping spurs nearby offer a stayover for any guests longing to linger at one of the remotest and most historic patches of prairie in North Dakota. History is also preserved at Knife River Indian Villages National Historic Site, a stretch of land along the Knife River north of Stanton where the NPS preserves the place where explorers Meriwether Lewis and William Clark met Sacagawea, their teenage interpreter. Hidatsa history dates back to at least the 14th century at the river sites, though humans have likely occupied the site for over 11,000 years, archaeological evidence shows. 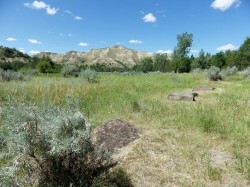 Circular mounds and pits of former earthlodges still remain at the site, and as one ranger put it, NPS knows Sacagawea’s hometown but not her street address at the Knife River Indian Villages. Following Lewis and Clark, history turned grim for the Mandans and Hidastas who lived at the villages. A smallpox epidemic decimated the tribes in 1837. The tribes moved upriver in 1845 to found Like-A-Fishhook Village, but the federal government forced the tribes to abandon their way of life and move onto the Fort Berthold Reservation, where the Three Affiliated Tribes have resided since 1885. 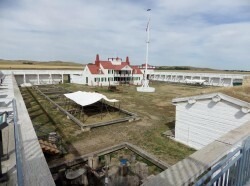 On the literal western edge of the state sits Fort Union Trading Post National Historic Site, a reconstruction of the longest operating fur trading post of the Upper Missouri. Fort Union operated from 1828 to 1867, drawing such names of its time as Blackfeet chief Buffalo Bull’s Back Fat, artists George Catlin and Karl Bodmer, Prince Maximilian of Wied, ornithologist John Hames Audubon and mountain man Jim Bridger. The fort’s dwellers portrayed a wide diversity with several native languages such as Assiniboine, Mandan and Crow, as well as English and French. Fort Union interpreters had to know these many languages. The fort was dismantled in 1867 after the federal government purchased Fort Union. Parts of the fort were moved to expand Fort Buford. Fort Union is also close to Fort Buford, a former frontier military fort, and the confluence of the Missouri and Yellowstone rivers, both sites operated by the State Historical Society of North Dakota. The scant remains of Mondak, Mont., lie just across the road from Fort Union as well. Mondak was an early 20th century boomtown that made it big selling alcohol to thirsty North Dakotans in a time when it was illegal to sell spirits in the state. Mondak’s jail still remains.